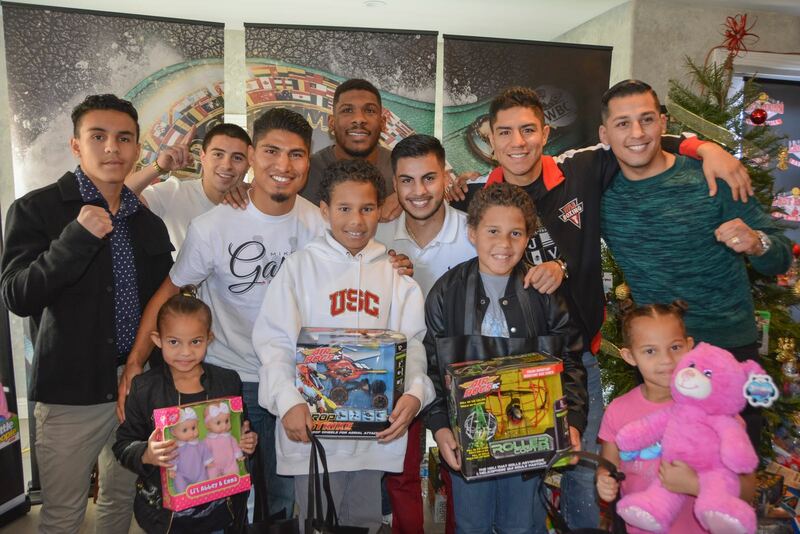 This past Sunday, December 17, Boxing restaurant Last Round Bar & Grill along with Supreme Boxing had its 1st Annual Holiday Toy Giveaway hosted by WBC World Lightweight Champion Mikey Garcia and friends in Ontario, CA. The event was a huge success with over 800 people showing up for gifts as well as many fans and press coming to donate gifts for the Children. WBC Champ Mikey Garcia, Former Champion Jessie Vargas, who had just fought and won his fight two days before, Contender Hugo Centeno Jr., along with prospects Joseph Landeros, Panchito De Vaca, Jose Gomez, Brandon Glanton, and Recording Artist Martin Castillo. ” I just had a baby girl a little over a month ago, I’m a Father now and just to be able to make one kid smile will make me happy. Thank you Last Round Bar & Grill and Supreme Boxing for inviting me!” – Hugo Centeno Jr.